Even if catching a Hollywood movie is not one of your top priorities when traveling abroad, in these particular cases you may want to think twice. The 80-year-old Cine Thisio totally lives up to the hype of its CNN rating as one of the most enjoyable open-air cinemas in the world. Get there early to avoid the long queue, grab a cheese pie and homemade cherry juice before settling down for some quality entertainment. Cine Paris, on the other hand, first opened in 1920 and, according to the Guardian newspaper, is one of the best open-air cinemas in Europe. 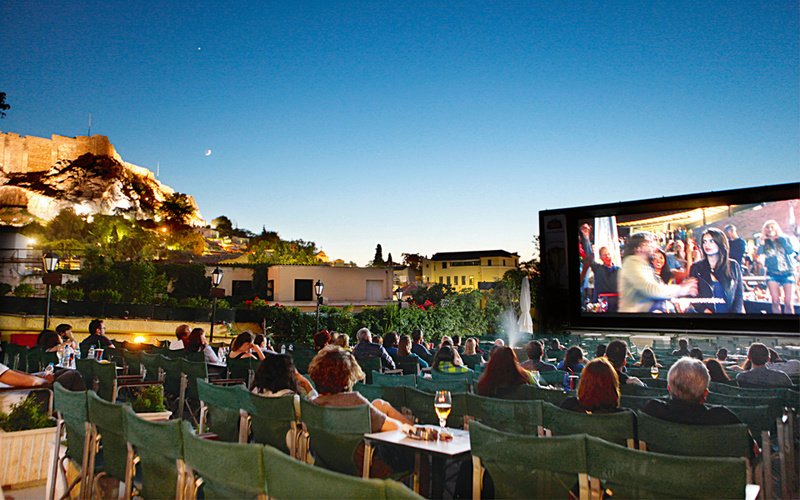 Located in picturesque Plaka, it offers nights filled with all the magic of the silver screen in leafy surroundings. Here, too, you can nab a hot dog or some popcorn and discover how a night at the movies can still be a truly unforgettable experience. On the ground floor there is a shop with an impressive selection of old movie posters. An added attraction of both cinemas is their location – at the foot of the enchantingly lit Acropolis – so don’t be surprised if you find yourself gazing at the Sacred Rock more than the screen! Both cinemas are open daily, with two shows per night, usually starting at around 8.45 p.m. and 11 p.m. For some visitors, there may be only one catch: as these are open-air cinemas, smoking is generally allowed.